Download our Business Software Whitepaper for tips on how our software can help your business grow. CUE is your one-stop-shop to discover, purchase and manage the bestaccountingsoftware and services for your business. CUE identifies the best software for growing your business, saving you time from browsing overwhelming review sites. Our prices are competitive and our CUE Dashboard makes it easy to manage your purchase. Let us do the work for you. Take the guesswork out of purchasing software by answering a couple questions about your business and get customized recommendations to help your business grow. Not sure which software fits your business needs? Try any of the CUE Managed recommended software FREE for 30 days! Get exclusive discounts on your subscription plans and more. Manage your software in a fast and secure way with the CUE Business Dashboard. Gain daily insight into the financial health of your business and enhance your marketing. Find out how this dashboard can revolutionize your business. You can rely on CUE for every stage of growing your business. 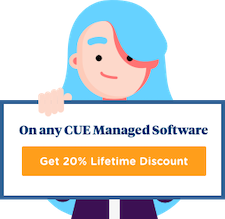 From recommending the right tools on day one to managing your team’s products, CUE is built to make sure you have everything you need to succeed with your business. What does your business need today? or call us anytime at 720-552-8975 (Mon-Fri 9-7 EST) and we'll help you get started. Or call us anytime at 720-552-8975 Mon-Fri 9-7 EST and we'll help you get started.